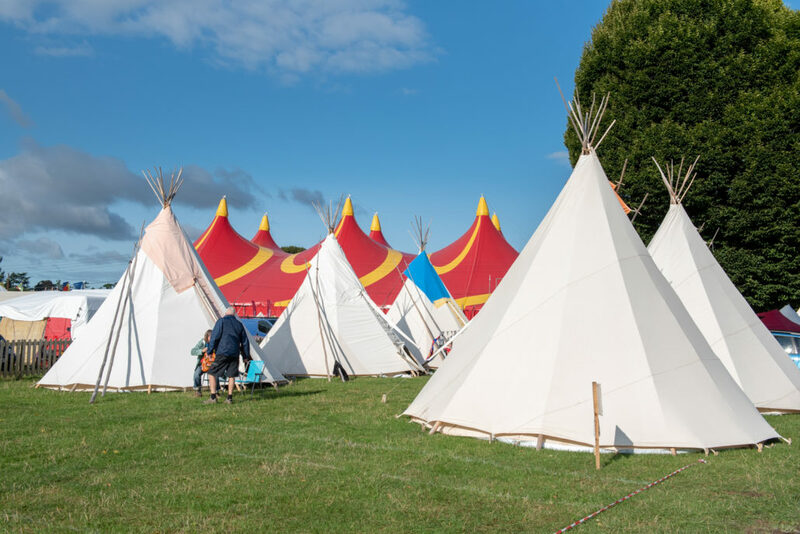 Black Dog Tipis will be back on site in 2019 with their glorious and comfy tipis and lotus tents to hire if you want to camp in style in a central location close to all the action. 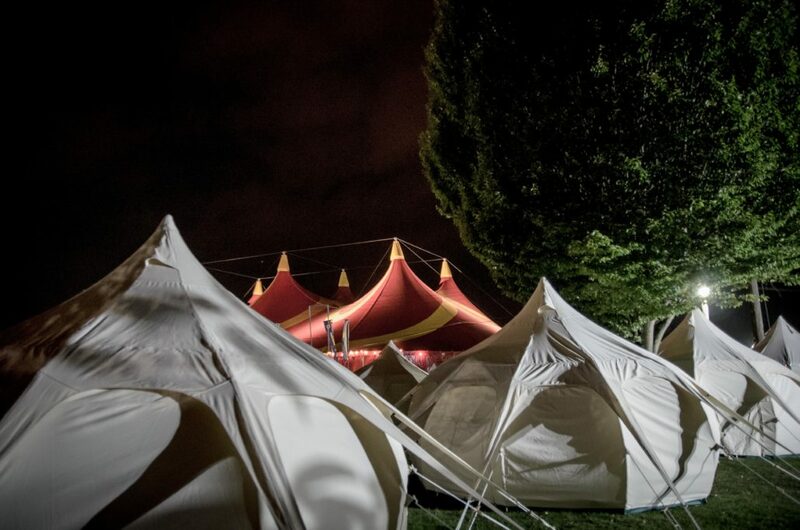 NB – you still have to buy and pay for camping with your festival ticket to ensure you have the correct wristband. 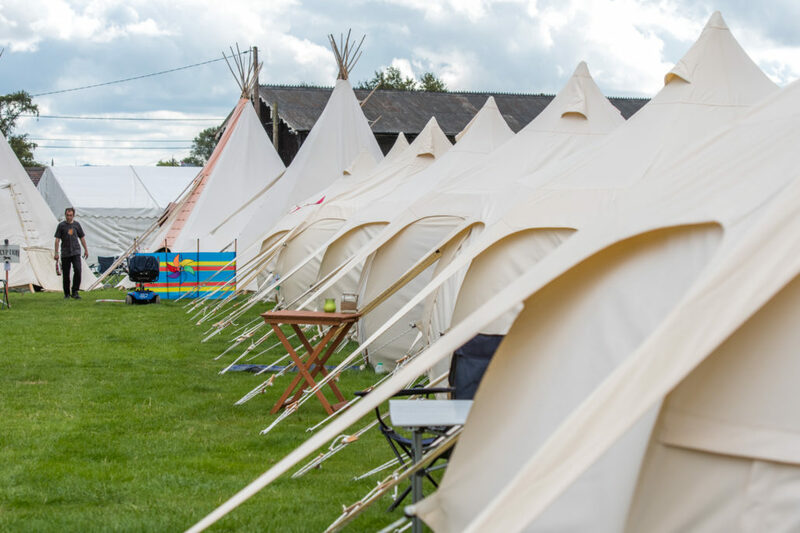 A firm festival favourite, Tipis offer comfortable and roomy accommodation so you can really make yourselves at home for the weekend. They are available in three different finishes so there’s something to suit couples, families, groups of friends and those who simply cannot live without their creature comforts! 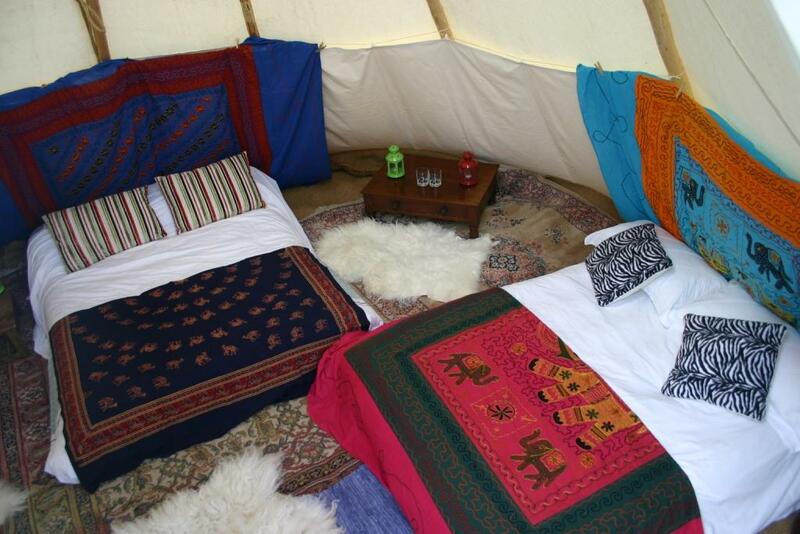 Sleeps up to six folk, Finished with a liner, groundsheet and coconut matting flooring, unfurnished. 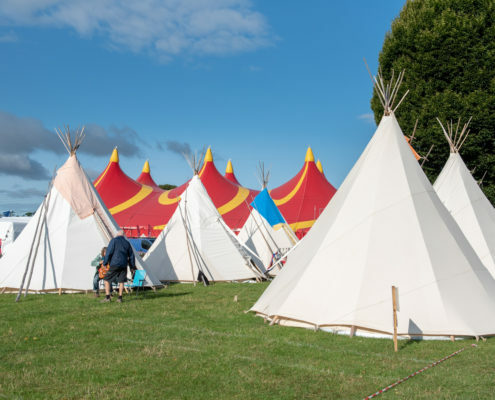 As the Regular Tipi plus; Cotton/wool rugs and real sheepskins, plenty of scatter cushions, low table with lantern and T lights provided, colourful Indian cotton hangings, rubber doormat in doorway and waste container and memory foam mattresses for up to six folk. 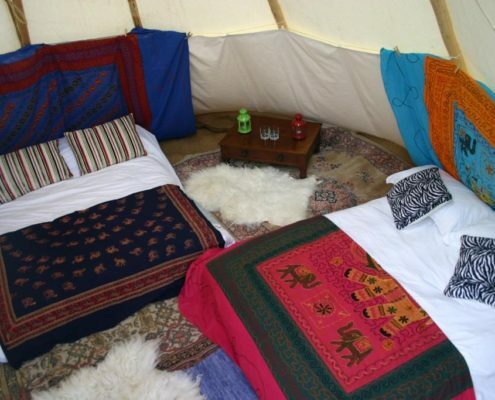 As the Luxury Tipi, but the mattresses come complete with fitted sheet, duvet, duvet cover and four pillows with pillowcases. 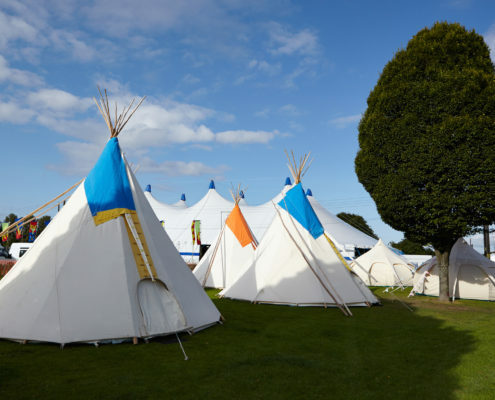 Loos and hot showers will be available for your use and comfort as well. 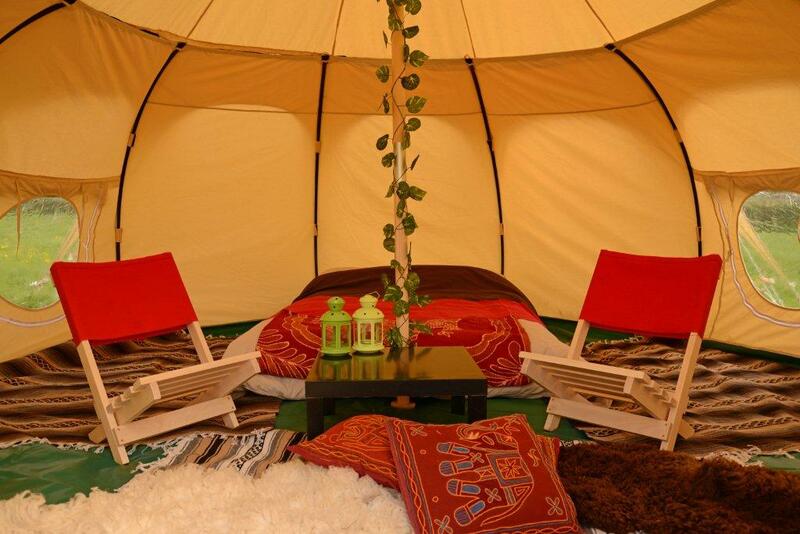 This beautiful luxurious and airy home from home is a 4m paradise, providing a light and spacious festival base. Ideal for couples. The two windows have blinds and there is almost 3m of headroom in the central area. 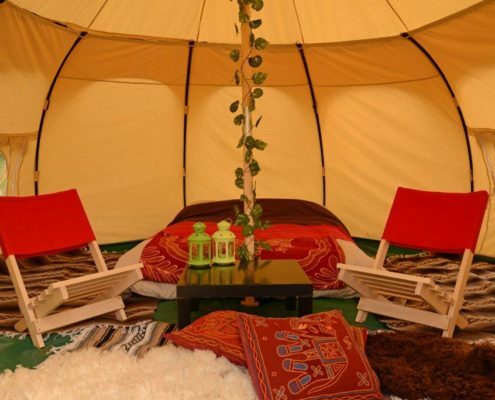 Sleeps two, Finished with Cotton/wool rugs, plenty of scatter cushions, low table with lantern and T lights provided, two chairs, rubber doormat in doorway and waste container and memory foam mattresses. 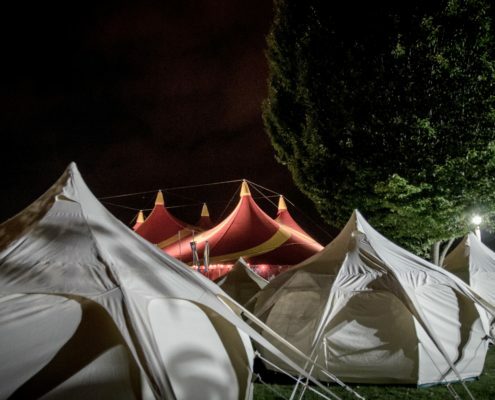 Sleeps two, as the Luxury Lotus Tent; but the mattresses come complete with fitted sheet, duvet, duvet cover and four pillows with pillowcases. 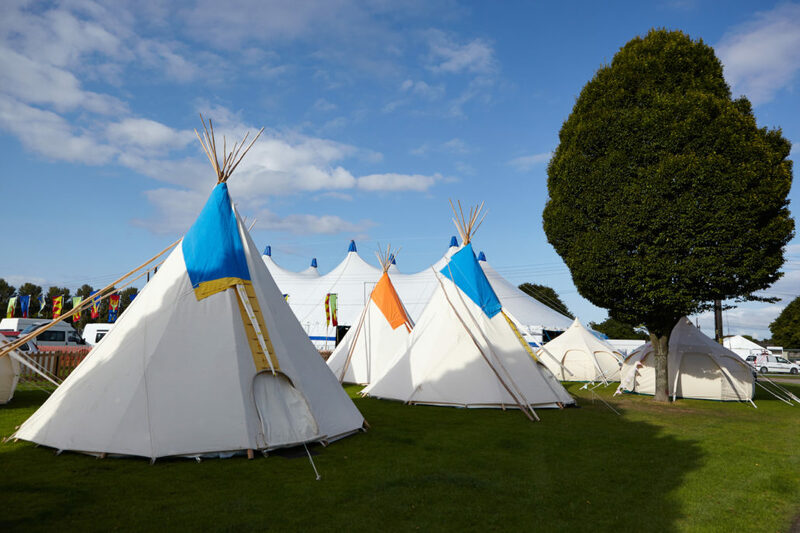 Loos and hot showers will be available for your use and comfort nearby. 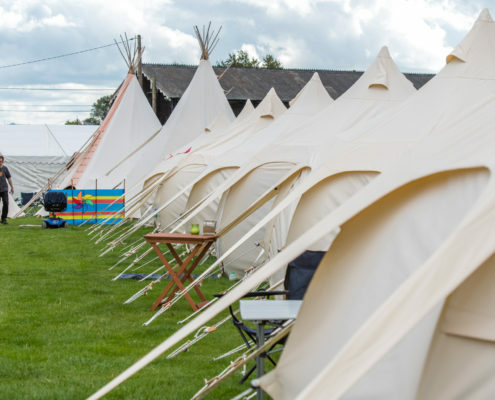 Your tipis and lotus tents are supplied directly to you by Black Dog Tipis. Please contact them with any queries on your booking.